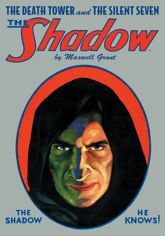 First, the Dark Avenger's investigation of the murderous Dr. Palermo leads him to invade "The Death Tower" and discover the existence of a hooded secret society, in the early novel that introduced reporter Clyde Burke and The Shadow's autogyro. Then, when a wealthy businessman is killed, The Shadow must infiltrate and unmask "The Silent Seven" to solve the murder! This classic pulp collection features the original color pulp covers by George and Jerome Rozen, plus historical commentary by Anthony Tollin and Will Murray. Softcover. 128 Pages. Black &White. 7" x 10"